These will be great holiday gifts! I'd love to try Calgon product. I'll look for it in Shoppers. @Kristy I KNOW, brings back major memories for me too! Hawaiian Ginger was everyone's fave at my school. I could totally use this! I am in desperate need of gift sets when the holidays roll around. 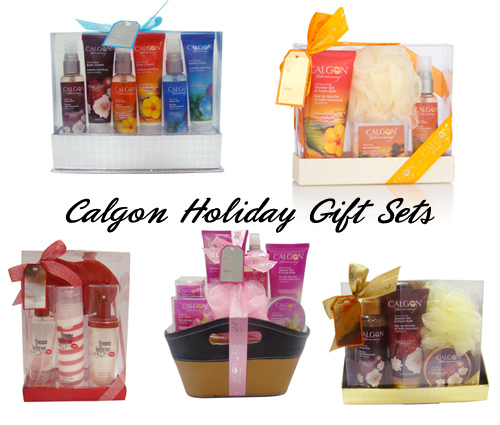 i love calgon, most of there products smell good!! Thanks for stopping by and for leaving a thoughtful comment on my blog. Follow each other? Oh gosh, during high school and undergrad, I need more Calgon like I needed a hole in the head! The holiday sets are so fun. I've used Calgon a lot but haven't bought anything in a long time because body sprays last forever, lol. I've tried a ton of different scents in both lotions and sprays and my favourite is Pear Caramel! lovely blog:) it's so cute here. I would love to get one of these for Xmas if you know what I mean! ;) A giveaway would be good!